With a flick of the switch, the transmitter booted up, the computer screen came to life, and the Yarrabah radio service began blasting out a great rock track, “Sweet Home Alabama”. There were no bells, no fanfare, but a few high fives, some man hugs and a new era in Aboriginal broadcasting as the Yarrabah radio service began broadcasting and joined the Black Star network. 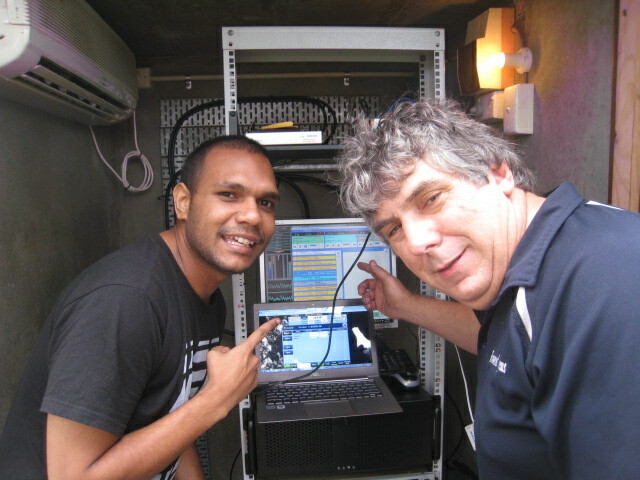 The radio service is the first building block towards a multi media centre in the town of Yarrabah. It will create opportunities for the large youth population in Yarrabah and will save them the long bus trips to Cairns to study. This way the trainers come to them, and train in their environment. Just a dream for many years, the Yarrabah service is now a reality. Over 20 years ago Yarrabah applied for a BRACS license, but were overlooked, being seen as as ‘not remote enough’. Although they are close to Cairns, as the crow flies, getting there is a considerable road trip and at the time of applying over 20 years ago Yarrabah was as remote a community as many other places. Yarrabah people are used to being left behind and battling for everything they get. “Yarri” as it is known by the people who come from there, is one of the largest Aboriginal communities in the country and now they have their own radio service and can choose what they like to listen to. The dial is in their hands, as many radio services can be picked up around the area. Some have good reception but the new service on a frequency of 92.9fm is by far the quality and superior sounding service. Once people find it they will like it. If Facebook is a guide then the number of early Likes indicate that Yarrabah people are switching on in large numbers. The people in Yarrabah and the surrounding communities now have a choice of music and information and can listen to the programs that they like. New figures released by the Australian Bureau of Statistics ABS named Yarrabah as the state’s poorest local government area. The ABS statistics rank parts of the country according to socio- economic advantage and disadvantage. Despite the ranking, the new Yarrabah council is active and members are working hard to implement a new vision and plan for the future, which includes a multi media centre. Council with support from QRAM are working together to establish the centre. QRAM has funded the service from funds derived from “closing the gap” campaigns run across the Black Star network. The traditional funding agency The Community Broadcasting Foundation (CBF) General Grants and Indigenous Grants Advisory Committees have not come to the party with support on the basis of low priority and that the service is new and has not been running for a period of two years. Begging the question what is the point of applying for something that has such restrictions. Yarrabah is an Aboriginal community at the bottom of all ABS indicators, and surely must be a high priority area. 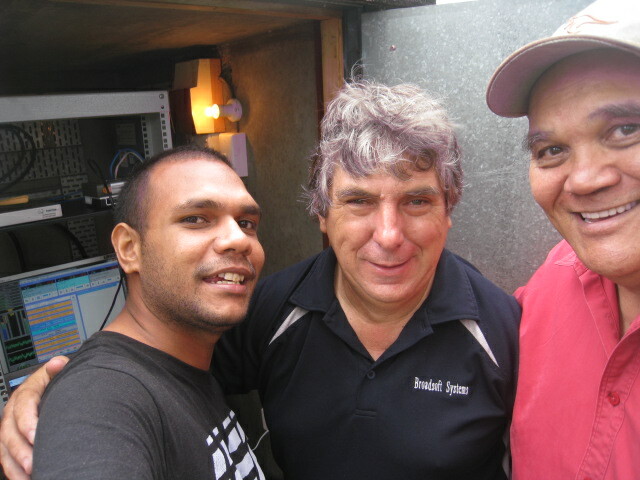 Yarrabah 92.9FM has come about because of a need for a quality listenable service that suits the need of everyone. It has a news service on the hour 7 days a week with the latest sporting updates. The station will also receive programs from the Black Star 2, the new satellite service with a combination of programs from Aboriginal and Islander radio services from around the country. Programs like the weekend football, sporting carnivals and cultural events can be broadcast from stations in the network to 13 other Black Star stations and also be available for national distribution to radio stations around the country. Yarrabah is keen to begin broadcasting football as soon as possible and are putting together a football call team. The Black Star WAN comes into its own allowing a Footy match between Yarrabah and the Atherton Tablelands, or any combinations of network stations, to be broadcast in only those 2 areas, while music and other programs are broadcast on the rest of the network. The Yarrabah service covers all of the Yarrabah Traditional Owner areas of Fitzroy Island, Green Island and communities to the south of the town of Yarrabah and parts of the northern beaches of Cairns. QRAM employee, Gilmore Johnson a traditional owner from Yarrabah, played a major role in the leg work required, Gerry Pyne nutted out the engineering and the site location and the Council and Mayor made things easy every step of the way. Now it’s time to sit back, relax and turn o your radio! Read more about Yarrabah here.